Home News Welcome to the new deSagaz website! 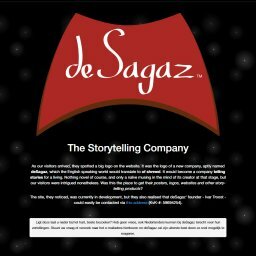 It is my pleasure to finally welcome you to deSagaz’ new website! Two years overdue, it will replace the simple Bootstrap-based website I hacked together when I first registered my company at the Dutch Chamber of Commerce (see Exhibit A). Even though some kind of magic provided enough Adventures to go on, it is a bit ironic that a web design company had such a front face. No more! I will still be working on translating the website to Dutch, as well as ensuring it is accessible for all users. Normally this needs to happen before a site is launched, of course, but I figured it could not really get too much worse than it was. I will also occasionally update this blog space with content that I feel is relevant to the world. So, no regular schedule, no forced blogs. Just things that are worth both our time. I am already thinking on a piece chronicling deSagaz’ first Adventure, as well as an opinion piece on my currently most despised profession: domain speculation. Ugh. That just left a bad taste in my mouth. Enough words spilled; rhetoric is only there to serve what we do best. Let’s. Adventure!